Master Sgt. 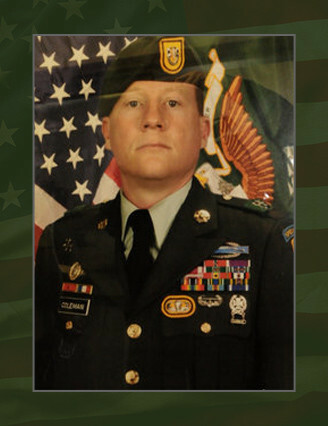 Mark W. Coleman, of Yelm, Wash. died when he stepped on an improvised explosive device on May 2, 2010, in Kandahar Province, Afghanistan. Coleman was assigned to C Company, 2nd Battalion, 1st Special Forces Group (Airborne), Joint Base Lewis-McChord, Wash. and was deployed in support of Operation Enduring Freedom-Afghanistan. This was his fifth deployment in support of an Overseas Contingency Operation. Coleman, a graduate of Goldendale High School in Goldendale, Wash., enlisted in the U.S. Army on Oct. 31, 1988, as a Fire Support Specialist. Upon completion of basic training and advanced individual training, Coleman was assigned to 2-32 FA in Wiesbaden Germany. Coleman served in numerous fire support assignments at Fort Sill, Okla., Camp Casey, Republic Of Korea and Joint Base Lewis-McChord. In 1999, Coleman volunteered for the Special Forces Assessment and Selection Course and completed the Special Forces Qualification Course in August 2001. Coleman was then assigned to 3rd Battalion, 1st Special Forces Group (Airborne) at Joint Base Lewis-McChord as a Special Forces weapons sergeant. He served in the unit from 2001-2006 and completed two rotations to the Philippines in support of Operation Enduring Freedom-Philippines. In 2006, Coleman was selected to participate in the Military Personnel Exchange Program and was assigned to the Australian Special Air Service Regiment. During his time with the Australian SAS, he completed two tours in Afghanistan in support of Operation Enduring Freedom-Afghanistan. In 2008, Coleman returned was assigned to 2nd Battalion, 1st Special Forces Group (Airborne) and completed a third rotation to Operation Enduring Freedom-Philippines. Coleman’s military education includes the U.S. Army Airborne School, Warrior Leaders Course, Basic Non-Commissioned Officers Course, Advanced Non-Commissioned Officers Course, Ranger School, Mountain Warfare School, Combat Life Savers Course, Survival, Evasion, Resistance and Escape Course, Air Assault Course, Jumpmaster Course, Joint Fire Power Course, Special Operations Target Interdiction Course, Special Forces Advanced Reconnaissance, Target Analysis, and Exploitation Techniques Course and the Special Forces Qualification Course. Coleman’s awards and decorations include the Meritorious Service Medal, the Army Commendation Medal, the Army Achievement Medal, the Army Good Conduct Medal, the National Defense Service Medal, the Korean Defense Service Medal, the Afghan Campaign Medal, the Global War on Terrorism Service Medal, the Non-commissioned Officer Professional Development Ribbon, the Army Service Ribbon, the Overseas Service Ribbon and the NATO Medal. Coleman earned the Special Forces qualification tab, the Ranger qualification tab, the Combat Infantryman Badge, the Parachutist Badge and the Air Assault Badge. Coleman is survived by his wife, Barbie of Yelm and their children, Brett of Fort Richardson, Alaska and Jessica of Yelm. He is also survived by his mother Alice Fay Eshelman of Centerville, Wash., his adoptive-father James Coleman of Wenatchee, Wash. and his father Harley Neal Vermilion of Texas.